Banana Split – n, a sundae creation of ice cream, banana, nuts, fudge, and a cherry on top. It’s been years since I’ve actually eaten a banana split, but they always sound good in theory. And anything that sounds good in theory sounds good in cupcake form! Preheat oven to 350 degrees Farenheit. 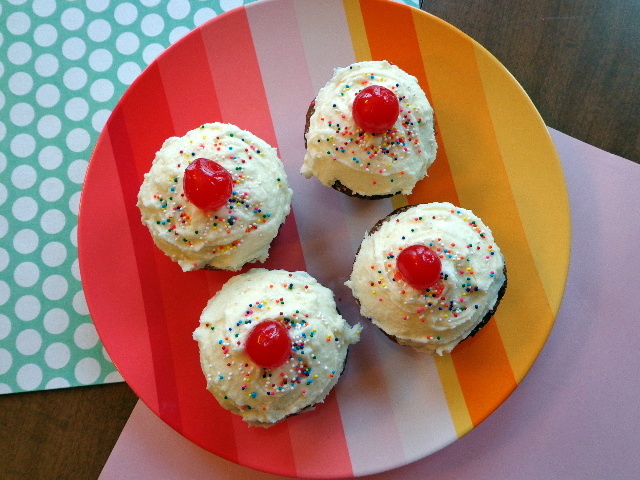 Line a cupcake tray with 12 paper liners. In a large bowl combine mashed banana, white sugar, egg, and melted butter. Stir to combine, then fold in flour mixture and mix just until smooth. Fold in walnuts. Fill each cupcake liner halfway with batter. Spoon 1 Tbsp fudge sauce into each cup. Top with remaining batter. Bake for 25-30 minutes. Allow cupcakes to completely cool before icing. While cupcakes are cooling, use an electric mixer to beat together softened butter, powdered sugar, and melted ice-cream. (This icing will keep best if stored in the fridge rather than at room temperature). 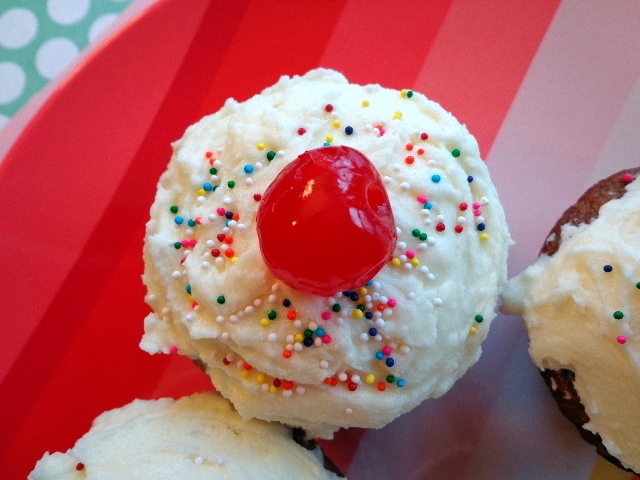 Ice cupcakes then top with cherries and sprinkles as desired.